My name is Serpent; Serpent Eye ! Grab your spade and off you go ! Start your farming spree with some potato ! Farming is fun, can't you all just see ? Don't you wish that you loved farming like me ?! Cause soon I'll be wearing that awesome green cape ! 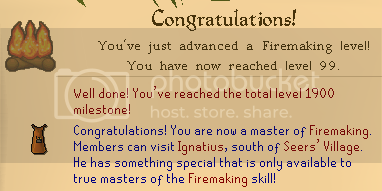 For the rest of the weekend, I'll just be Firemaking again. I have an odd thousand or so Magic logs left, and then back to Maples. THE HISTORY of SERPENTS: a blog > JK I really do quit.